Toronto’s iconic Horseshoe Tavern is not the place one would expect to see a dance show, they say so themselves, but this was a special night and their 70th anniversary month. Despite it being primarily an indie rock venue, Slow Magic‘s show blended right in and everyone who did want to dance found their way to the small dance floor. Now on to the show. The evening’s performances begun with up and coming DJ/producer Qrion originally from Sapporo, Japan (currently San Francisco). She’s worked with the producers like Ryan Hemsworth, How To Dress Well, and Giraffage, and those influences are immediately visible. Qrion comes off as a fairly shy soul – perhaps she’s still finding her footing – nonetheless, her musical presence is well defined. Playing a well mixed variety of tracks like Giraffage’s “Tell Me,” Kendrick Lamar’s “Alright,” J Hus’ “Plottin” and occasionally overlaying subtle samples, she reminded me of early days of TOKiMONSTA and that’s a high comparison to make. The track that got everyone going, however, was a Qrion original “iPhone Bubbling” – a song made entirely of iPhone text message sounds. Can’t wait to see what she does next. 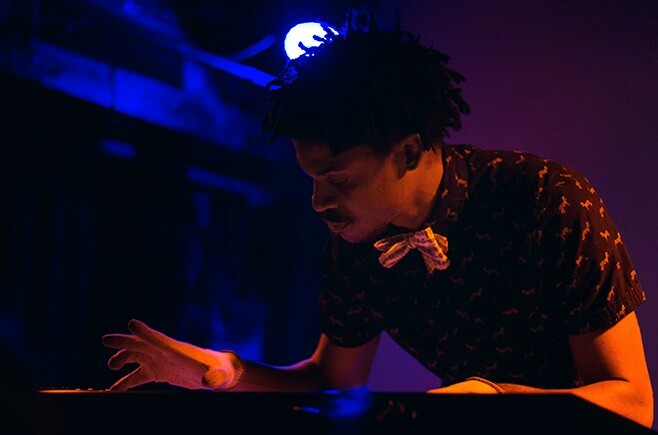 Next up was Omniboi, in his own words, Omni Rutledge is “a video game/comic book nerd cooking up sweet tunes.” Looking proper with a bowtie, playing keys and messing around with a sampler Omniboi is an interesting act to see. Earlier this year he released Signals EP so, naturally, a large portion of this set was focused on the original tracks but a few solid remixes, such as Bad And Boujee “Migos,” Drake’s “Hotline Bling” and a nod to Rihanna’s “Work” were a nice addition. After a brief break the main act finally took the stage. 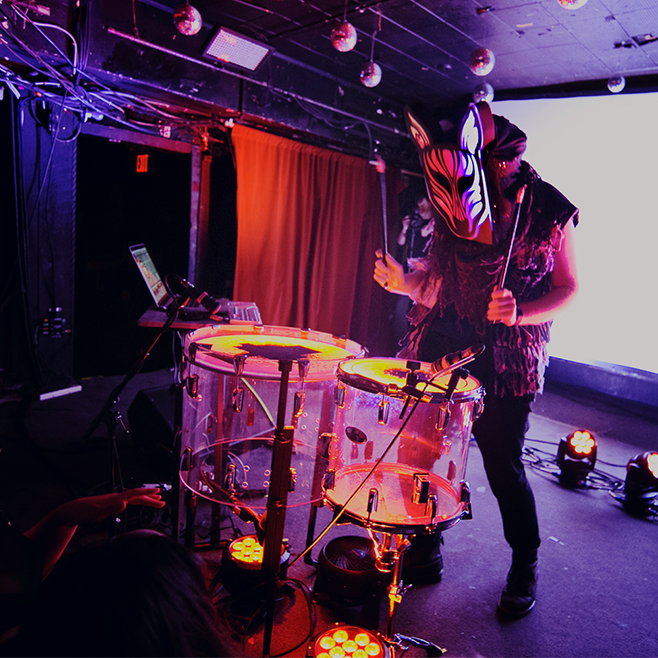 Slow Magic’s performance is one of those special ones, and yes, the mask has a lot to do with it. But Slow Magic, to quote Shia LaBeouf, is more than meets the eye. What makes his shows special more than his library of music, and let’s be honest the latest release Float is damn spectacular, but his on-stage presence is not to be missed. A few songs into the set he hopped into the tight Horseshoe crowd with his drum set, getting close and personal with the audience. Naturally, “Waited 4 U” Odesza remix got everyone singing along and for the rest of the night fans were making heart shapes in the air, an ongoing love exchange and positive vibes spreading through in the air. Playing through a mix of tracks from Float and How To Run Away, as well as some Giraffage collaborations, he gave every fan their favourite song. Good night Toronto. Till next time.